The painting “Harlequin” was painted by Pablo Picasso in 1917. The reason for writing the picture was a trip with his future wife, Olga Khokhlova, and the circus on tour to Barcelona. After the trip, Picasso painted a portrait of Olga and the sad “Harlequin” in a bluish shirt. In general, the circus played an important role in the creation of many works by Picasso, serving both as a theme and a motive for writing them. The artist began his fascination with the theme of circus and circus performers supposedly from 1905, after he visited the circus of Medrano, then becoming his frequenter. Harlequin, the comic and cheerful hero, is depicted already outside his image. Not having had time to take off his checkered stage costume, he had already taken off his mask of joy and causeless joy. No, he is not in sorrow and not in despair, but his gaze and facial features betray a little sadness and, to a greater degree, fatigue. We see in him a person who is no different from any of us, who, outside the stage, does not continue to play in public, but simply lives, worrying and rejoicing only in reality. Yes, no in this picture of the circus and vivid ideas, the author here is only interested in the personality of the person, his soul. Clowns and harlequins, circus participants, are seen in these pictures in a completely new way: after the performance or in everyday life, they live as if they are not working in a circus. 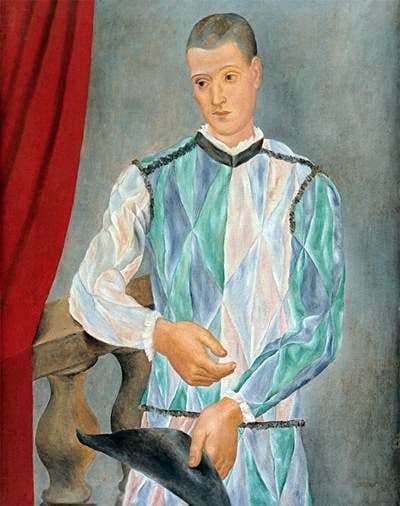 The presence of circus paraphernalia in such paintings: costume, curtains, make-up or scenery enhances the effect, making it possible to match the image in the picture in which the character presents the public. They are shown in everyday life, family or at rehearsal. Circus players are dressed in the costumes of their heroes. In life, these people are unselfish, honest, and kind; hypocrisy and self-interest are alien to them. This is exactly how the circus world saw Pablo Picasso, whom he knew well.